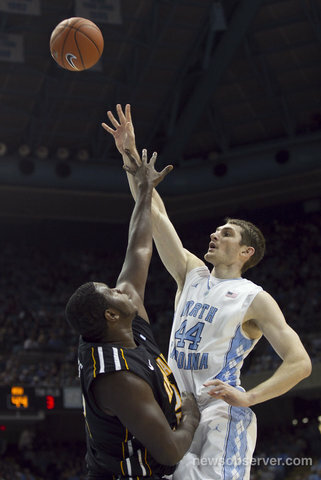 #5 NORTH CAROLINA 97, Appalachian State (Mountaineers, 20,222 students, Boone, NC) 82 -- Tyler Zeller flirted with a career scoring high, finishing with 31 points and 10 rebounds to lead the fifth-ranked Tar Heels past the Mountaineers. John Henson added 17 points for the Tar Heels (9-2), whose third straight win and 22nd in a row at the Dean Smith Center wasn't as lopsided as it could have been. They shot 54.5 percent, never trailed and led by 29 before allowing Appalachian State (4-6) to cut deeply into that big lead. It was an unpleasant homecoming for former Tar Heel Jason Capel who is now the head coach at App State. 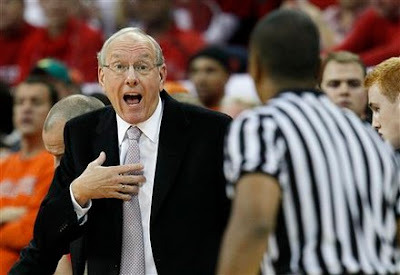 #1 Syracuse (Orange, 20,407 students, Syracuse, NY) 88, N.C. STATE 72 -- The The Orange (11-0) won thanks to the outside shooting of Dion Waiters, James Southerland and Kris Joseph, who each hit three 3-pointers. But the Wolfpack (6-4) showed at times it is capable of playing with the nation's top team, thanks to the leadership of senior swingman C.J. Williams and his running teammates. MIAMI 93, Florida Atlantic (Owls, 29,290 students, Boca Raton, FL) 90 -- Center Reggie Johnson made his season debut to give the Miami Hurricanes a lift, and they overcame the heroics of freshman Omari Grier to beat Florida Atlantic in double overtime. Johnson, back after undergoing right knee surgery in June, came off the bench and had 15 points, nine rebounds, five blocks and five assists. Grier, making his first start, scored a season-high 27 points. He sank a 3-pointer for the final points in regulation, and another 3 to force the second overtime. Miami (6-4) shot 62 percent, including 14 for 20 from 3-point range. 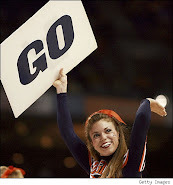 Florida Atlantic (4-7) went 15 for 29 on 3-pointers. The Hurricanes' Kenny Kadji scored 21 points and was chosen as the game's most valuable player in the Orange Bowl Classic game. He went 4 of 5 from 3-point range. VIRGINIA TECH 85, Campbell (Fighting Camels, 10,471 students, Buies Creek, NC) 60 -- Virginia Tech opened the second half with a 15-0 run to break open a close game and roll past Campbell at Cassell Coliseum. With the win, Tech moved to 8-3 overall on the season and won its third straight game. Campbell fell to 8-3. CLEMSON 60, Winthrop (Eagles, 5,097 students, Rock Hill, SC) 40 -- The Tigers rode an efficient offensive effort from its senior leaders and a stifling second half defensive performance. The victory pushes the Tigers above the .500 mark for the season at 5-4, while the Eagles fell to 4-7. Tanner Smith and Andre Young paced the Tigers in scoring, pouring in more than half of the team's point total. Smith tied a career-high with 17 points on only nine field goal attempts, converting on two of his three shots from three-point range. Young added 15 points on eight shot attempts and dished out four assists in the game.